As human beings, we are all to a greater or lesser degree, sentimental creatures. Before the curtain rises on “The Fatal Weakness” by George Kelly. 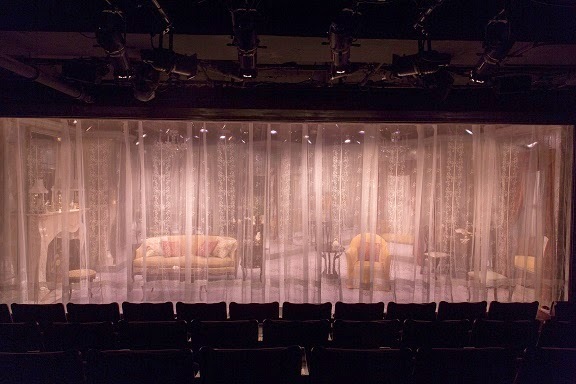 Set design for The Mint Theater production by Vicki R. Davis. “The Fatal Weakness,” written by George Kelly in 1946, in revival at The Mint Theater through October 26th, is man’s (and woman’s) essential romanticism. 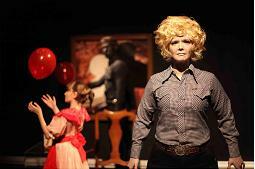 Kristin Griffith as Mrs. Ollie Espenshade in “The Fatal Weakness” by George Kelly.Photo by Richard Termine. It leads Mrs. Ollie Espenshade (Kristin Griffith) to attend random weddings and her husband Paul (Cliff Bemis) to find a little extra kick in his step. On the other hand, their daughter, Penny Hassett (Victoria Mack) wears a veneer of cynical bravado. Can her free-thinking views on marriage be upended by her husband Vernon’s (Sean Patrick Hopkins) staunch fidelity? 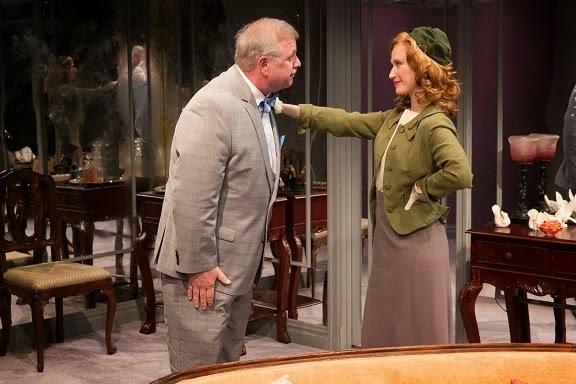 “The Fatal Weakness” is a top-shelf drawing room comedy.Under Jesse Marchese’s direction, George Kelly’s upper crust comedy is perfectly paced. The actors, all outstanding, bring this charming play to life. Kristin Griffith, as Ollie, is centerstage, and gives a wonderfully nuanced performance. as Mrs. Mabel Wentz in “The Fatal Weakness” by George Kelly.Photo by Richard Termine. Ollie’s friend Mrs. Mabel Wentz (Cynthia Darlow) delights in carrying tales. She has no illusions about why Paul has begun whistling and paying such careful attention to his wardrobe. Hers is a kind of inverse of romanticism. 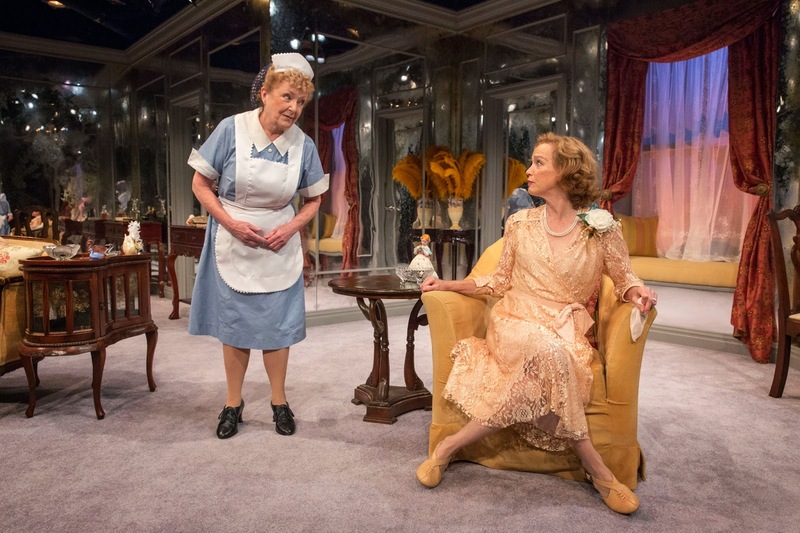 Unlike Penny or Ollie, Anna (Patricia Kilgarriff), the household maid, may be the only one completely clear-eyed about how relationships prosper or end. Andrea Varga. Photo by Richard Termine. 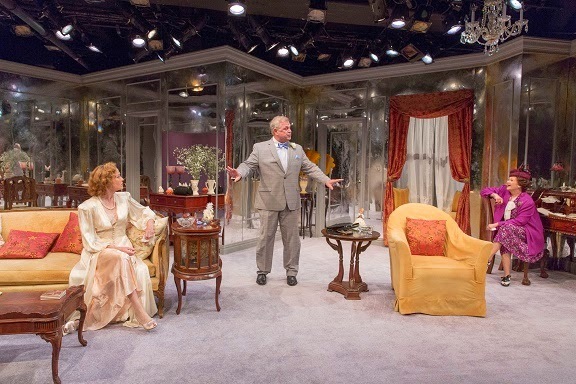 As “The Fatal Weakness” opens, a lace curtain rises to reveal a stunningly opulent room, designd by Vicki R. Davis, with mirrored walls and plush furniture. 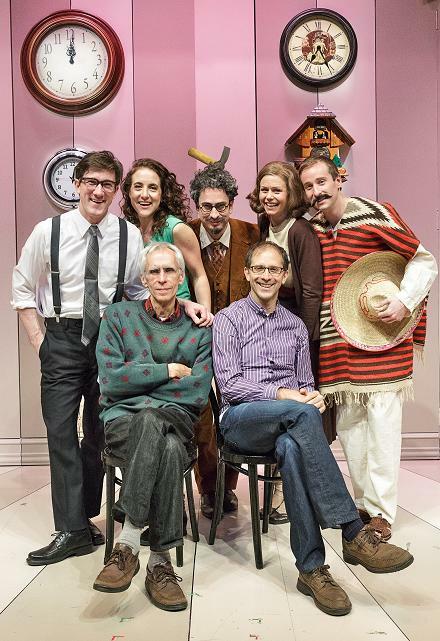 The Mint Theater has once again rediscovered a lively and enjoyable jewel of a “forgotten” play. 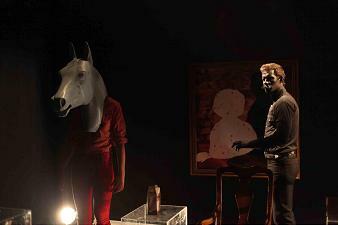 For more information about “The Fatal Weakness,” please visit www.minttheater.org. Being drunk and lovesick may not be an ideal combination. 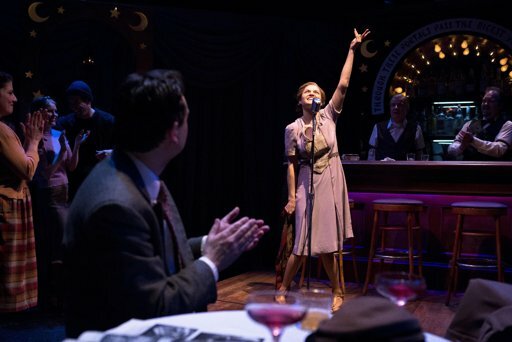 In Anita Loos’s “Happy Birthday,” at Theatre Row;s Beckett Theatre in a TACT production through April 13th, the combination proves magical. Mary Bacon as Addie Bemis and Todd Gearhart as Paul Bishop in “Happy Birthday.” Photo by Hunter Canning. The mousy librarian, Miss Addie Bemis (Mary Bacon) is lovestruck. She shows up at Gail Hosmer’s (Karen Ziemba) Jersey Mecca Cocktail Lounge to warn Paul Bishop (Todd Gearhart) that her father Homer (Anderson Matthews) intends him harm. Paul is the object of Miss Bemis’s affections. Addie’s barroom full of new friends, and the audience, are all pulling for her. The bartender, Herman (Ron McClary) gives her godfatherly advice. She sings, she dances, but can she prevail over Miss Carson’s obvious charms? 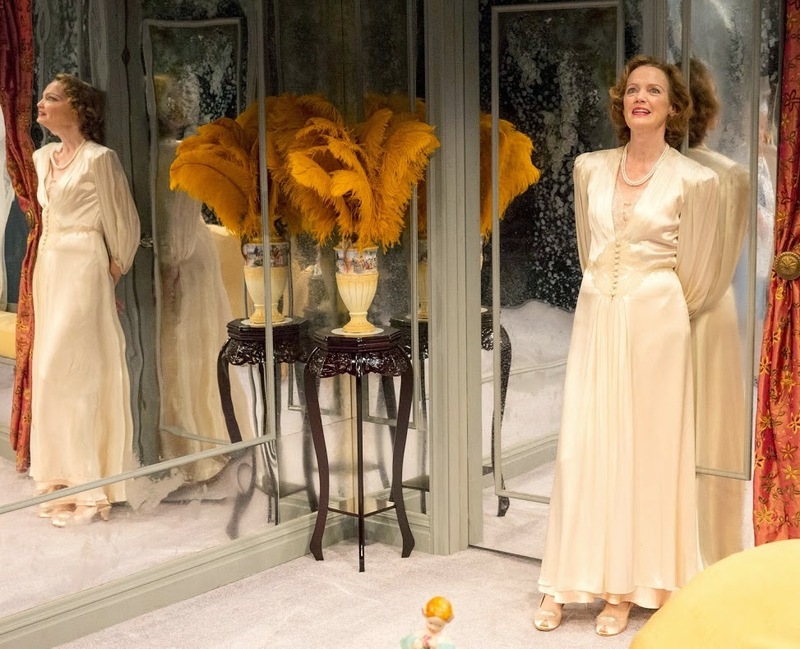 The large cast to a man and woman are as delightful as the lighthearted, but savvy, romance in “Happy Birthday.” Mary Bacon is especially poweful, as she carries Addie seamlessly from stiff to giddy. The TACT’s “Happy Birthday” is a gift. Smart and funny always makes for a good time. 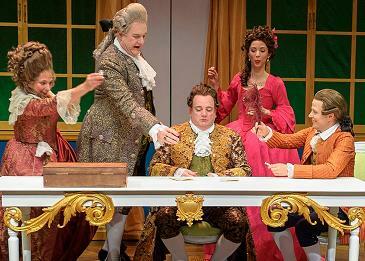 “Figaro,” at the Pearl Theatre extended through December 2nd, is the very smart and very funny marriage of Beaumarchais and playwright Charles Morey. 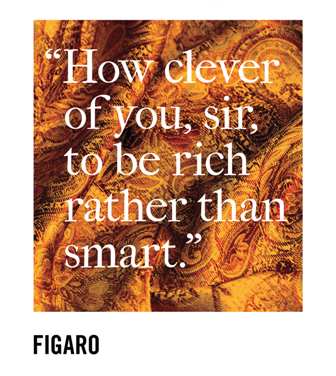 Witty and well-paced, “Figaro” is full of all the complications created by Pierre Caron de Beaumarchais in his 1778 play, “Le mariage de Figaro” and some ultra-modern solutions offered by Morey. 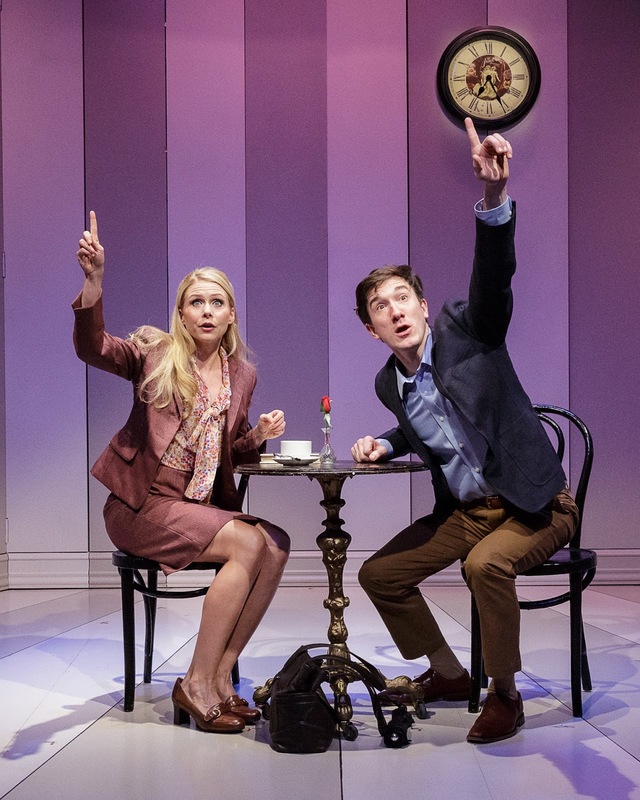 There are many obstacles in the way before Figaro (Sean McNall) and Suzanne (Jolly Abraham) can get married. Their employer and patron who must sign the marriage banns, Count Almaviva (Chris Mixon), is a randy fellow who has made Suzanne a project of his affections. Figaro is both hero and narrator, engaging the audience as he explains his backstory. He makes allusions to his stint as “The Barber of Seville” as well as to Mozart’s version of “The Marriage of Figaro.” His political and social commentary has a very contemporary feel. “Figaro” features stock characters that are not stick figures but beautifully fleshed out. 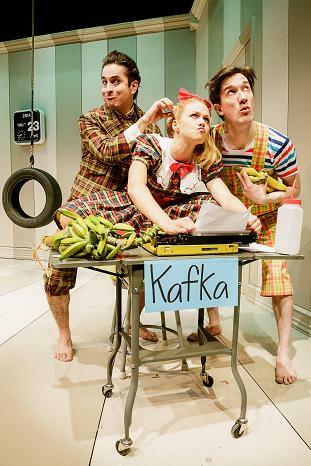 Broad and charming comedy is the calling card of this entertaining production. Expertly directed by Hal Brooks, the actors do an excellent job. 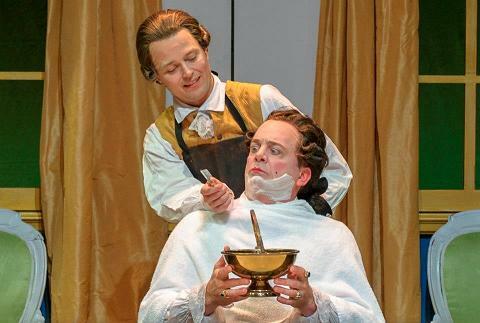 Sean McNall is so comfortable as Figaro that he makes us all feel at home. He has what can only be called an iridescent charm. Jolly Abraham is a fetching Suzanne, aided by the clever Countess (Joey Parsons) in making the little subplots unravel hilariously. Chris Mixon’s comic timing is superb; he is at once cadgy and clueless.